Makeup setting mists are perfect for anytime of the year, but are essential for summer to keep your makeup from melting off in the heat. Kat Von D Lock-It Makeup Setting Mist is one of the best on the market at keeping makeup on your face instead of having it kind of slide off and look ruined. It is a refreshing, weightless micro-mist that locks in makeup for up to 24 hours, a full 8 hours longer than other setting sprays. This unstoppable formula has a luxurious, soft mist for an upgraded experience. The advanced misting system features an aerosol-alternative sprayer to deliver the continuous fine mist of an aerosol in an environmentally friendly format. This refreshing, weightless spray keeps your makeup looking fresh and vibrant for a up to 24-hours. It is ideal for all skin types and it is powerful enough to lock-in looks yet light enough to wear all day, every day. Skin stays comfortable with a blend of naturally refreshing ingredients and a light cucumber scent for an instant boost. The setting mist feels totally undetectable on the skin, with no tightness or sticky residue. The advanced ultra-fine mist system dispenses a higher concentration of micro-droplets to prevent uneven application and wet spots on the face. Because Lock-It Makeup Setting Mist's application is so light and soft, you can hold the mister as close as you’d like to your face, for better accuracy and control. 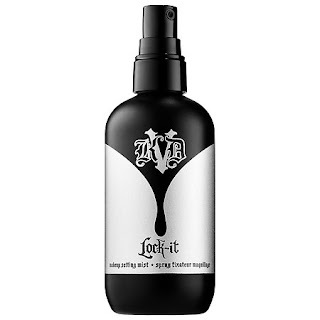 Lock-It Makeup Setting Mist contains Kat Von D's original Lock ‘N’ Load Setting Spray formula, with a revamped look and upgraded experience. This product is vegan, completely free of any animal derived ingredients and her products are never tested on animals. I've tried many makeup setting sprays. This is definitely one of the best, if not the best one I have tried. Why? Because of the fine mist that it produces. It does not produce large droplets that just land on the face like others do. The mist is so fine and it dries quickly, you can have your makeup set in no time flat. Like all of the Kat Von D line, it is a high quality product with much care and thought put into it. With this setting spray, I can spray closer to my face, which means I can spray my eyes (closed of course), and get the makeup not to melt off in the heat. I am VERY happy with this product. Very. Kat Von D Lock-It Makeup Setting Spray retails for $26.00 is available from www.sephora.com, www.katvondbeauty.com and SEPHORA stores. Like SEPHORA on Facebook: https://www.facebook.com/Sephora?ref=br_tf; Follow SEPHORA on Twitter: @Sephora, Follow SEPHORA on Pinterest: http://www.pinterest.com/Sephora/; Follow SEPHORA on Instagram: http://instagram.com/SEPHORA#; Subscribe to SEPHORA on YouTube: http://www.youtube.com/channel/UC9YX5x_VU8gfe0Oui0TaLJg; Follow on Google+: https://plus.google.com/+ Sephora/posts; Follow SEPHORA on Wanelo: http://wanelo.com/sephora and Follow SEPHORA on Tumblr: http://theglossy.sephora.com/. Like Kat Von D on Facebook: https://www.facebook.com/katvond. Follow Kat Von D on Twitter: @thekatvond.